A Saturday afternoon in the park in winter? A great time to ski up to Tower Fall. Pity poor Moran Point along the Grand Canyon of the Yellowstone, for it is unjustly forgotten. Yellowstone National Park has announced a new all ages coloring book entitled Yellowstone: Color It Wild. The Devil’s Slide might sound like a chief attraction for an amusement park; perhaps it’s a rollicking roller coaster or an impressively large log flume. 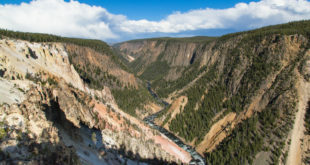 Although it was not the first expedition through the region, the 1871 Hayden Geological Survey really did help Yellowstone become a national park.